ARTEMIS AND THE GUARDIAN OF THE PORTAL. Sir Gardner Wilkinson states (see text-figure, p. 179, b) that "a basket of sycamore figs" was originally the hieroglyphic sign for a woman, a goddess, or a mother. Later on (p. 199) I shall refer to the possible bearing of this Egyptian idea upon the origin of the Hebrew word for mandrakes and the allusion to "a basket of figs" in the Book of Jeremiah. The life-giving powers attributed to "love-apples" and the association of these ideas with the fig-tree may have facilitated the transference of these attributes of "apples" to those actually growing upon a tree. [paragraph continues] Mother (Hathor) and the Sun-god (Horus), to which I have referred in my discussion of the dragon-story. But when Apollo's form emerges more clearly he is associated not with Aphrodite but with Artemis, whom Dr. Rendel Harris has shown to be identified with the mugwort, Artemisia. The association of the goddess with this plant is probably related to the identification of Sekhet with the marsh-plants of the Egyptian Delta and of Hathor and Isis with the lotus and other water plants. Any doubt as to the reality of these associations and Egyptian connexions is banished by the evidence of Artemis's male counterpart Apollo Hyakinthos and his relations to the sacred lily and other water plants. 1 Artemis was a gynæcological specialist: for she assisted women not only in childbirth and the expulsion of the placenta, but also in cases of amenorrha and affections of the uterus. She was regarded as the goddess of the portal, not merely of birth, 2 but also of gold and treasure, of which she possessed the key, and of the year (January). This brings us back to the guardianship of gold and treasures which plays so vital a part in the evolution of the Mediterranean goddesses. For, like the story of the dog and the mandrake, it emphasizes the conchological ancestry of these deities and their connexion with the guardians of the subterranean palaces where pearls are found. But Artemis was not only the opener of the treasure-houses, but she also possessed the secret of the philosopher's stone: she could transmute base substances into gold, 3 for was she not the offspring of the Golden Hathor? To open the portal either of birth or wealth she used her magic wand or key. As Nūb, the lady of gold, the Great Mother could not only change other substances into gold, but she was also the guardian of the treasure house of gold, pearls, and precious stones. Hence she could grant riches. Elsewhere in this chapter (p. 221) I shall explain how the goddess came to be identified with gold. (a) Winged Disk from the Temple of Thothmes I. (h) Persian design of Winged Disk above the Tree of Life (Ward, "Seal Cylinders of Western Asia," Fig. 1109). (c) Assyrian or Syro-Hittite design of the Winged Disk and Tree of Life in an extremely conventionalized form (Ward, Fig. 1310). (d) Assyrian conventionalized Winged Disk and Tree of Life, from the design upon the dress of Assurnazipal (Ward, Fig. 670). (e) Part of the design from a tablet of the time of Dungi (Ward, Fig. 663). The Tree of Life (or the Great Mother) between the two mountains: alongside the tree is the heraldic eagle. (f) Design on a Cretan sarcophagus from Hagia Triada (Blinckenberg, Fig. 9). The Tree of Life has now become the handle of the Double Axe, into which the Winged Disk has been transformed. But the bird which was the prototype of the Winged Disk has been added. (g) Double axe from a gold signet from Acropolis Treasure, Mycenæ (after Sir Arthur Evans, "Mycenæan Tree and Pillar Cult," p. 10). 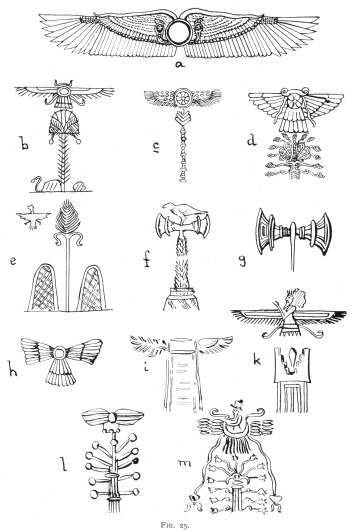 (h) Assyrian Winged Disk (Ward, Fig. 608) showing reduplication of the wing-pattern, possibly suggesting the doubling of each axe-blade in g.
(i) "Primitive Chaldean Winged Gate" (Ward, Fig. 349). The Gate as the Goddess of the Portal. (k) Persian Winged Disk (Ward, Fig. 1144) above a fire-altar in the form suggestive of the mountains of dawn (compare Fig. 26, c). 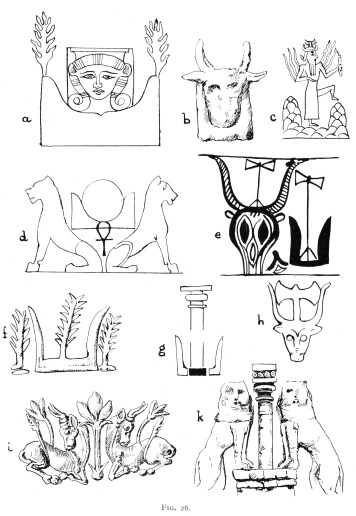 (l) An Assyrian Tree of Life and Winged Disk crudely conventionalized (Ward, Fig. 691). (m) Assyrian Tree of Life and "Winged Disk" in which the god is riding in a crescent replacing the Disk (Ward, Fig. 695). Artemis was a moon-goddess closely related to Britomartis and Diktynna, the Cretan prototype of Aphrodite. These goddesses afforded help to women in childbirth and were regarded as guardians of the portal. The goddess of streams and marshes was identified with the mugwort (Artemisia), which was hung above the door in the place occupied at other times by the winged disk, the thunder-stone, or a crocodile (dragon). As the guardian of portals Artemis's magic plant could open locks and doors. As the giver of life she could also withhold the vital essence and so cause disease or death; but she possessed the means of curing the ills she inflicted. Artemis, in fact, like all the other goddesses, was a witch. In former lectures 3 I have often discussed the remarkable feature of Egyptian architecture, which is displayed in the tendency to exaggerate the door-posts and lintels, until in the New Empire the great temples become transformed into little more than monstrously overgrown doorways or pylons. I need not emphasize again the profound influence exerted by this line of development upon the Dravidian temples of India and the symbolic gateways of China and Japan. This significance of gates was no doubt suggested by the idea that they represented the means of communication between the living and the dead, and, symbolically, the portal by which the dead acquired a rebirth into a new form of existence. It was presumably for this reason that the winged disk as a symbol of life-giving, was placed above the lintels of these doors, not merely in Egypt, Phnicia, the Mediterranean Area, and Western Asia, but also in America, 4 and in modified forms in India, Indonesia, Melanesia, Cambodia, China, and Japan. to represent the eyes of Re or of Horus himself in place of the more usual winged disk. In the Ægean area the original practice of representing the Great Mother was retained long after it was superseded in Egypt by the use of the winged disk (the sun-god). Over the lintel of the famous "Lion Gate" at Mycenæ, instead of the winged disk, we find a vertical pillar to represent the Mother Goddess, flanked by two lions which are nothing more than other representatives of herself (Fig. 26). In his "Mycenæan Tree and Pillar Cult," Sir Arthur Evans has shown that all possible transitional forms can be found (in Crete and the Ægean area) between the representation of the actual goddess and her pillar- and tree-manifestations, until the stage is reached where the sun itself appears above the pillar between the lions. 1 In the large series of seals from Mesopotamia and Western Asia which have been described in Mr. William Hayes Ward's monograph, 2 we find manifold links between both the Egyptian and the Minoan cults. The tree-form of the Great Mother there becomes transformed into the "tree of life" and the winged disk is perched upon its summit. Thus we have a duplication of the life-giving deities. The "tree of life" of the Great Mother surmounted by the winged disk which is really her surrogate or that of the sun-god, who took over from her the power of life-giving (Figs. 25 and 26). In an interesting Cretan sarcophagus from Hagia Triada 3 the life-giving power is tripled. There is not only the tree representing the Great Mother herself; but also the double axe (the winged-disk homologue of the sun-god); and the more direct representation of him as a bird perched upon the axe (Fig. 25, f). mounted on a chariot' (IX, 4, 76, verse 2)"(p. 171). "Soma was the giver of power, of riches and treasures, flocks and herds, but above all, the giver of immortality" (p. 140). Sir Arthur Evans is of opinion "that in the case of the Cypriote cylinders the attendant monsters and, to a certain extent, the symbolic column itself, are taken from an Egyptian solar cycle, and the inference has been drawn that the aniconic pillars among the Mycenæans of Cyprus were identified with divinities having some points in common with the sun-gods Ra, or Horus, and Hathor, the Great Mother" (op. cit., pp. 63 and 64). The horizon is the birthplace of the gods; and the birth of the deity is depicted with literal crudity as an emergence from the portal between its two mountains. The mountain splits to give birth to the sun-god, just as in the later fable the parturient mountain produced the "ridiculous mouse" (Apollo Smintheus). The Great Mother is described as giving birth"the gates of the firmament are undone for Teti himself at break of day" [that is when the sun-god is born on the horizon]. "He comes forth from the Field of Earu" (Egyptian Pyramid TextsBreasted's translation). (b) The mountains of the horizon supporting a cow's head as a surrogate of Hathor, from a stele found at Teima in Northern Arabia, now in the Louvre (after Sir Arthur Evans, op. cit., p. 39). This indicates the identity of what Evans calls "the horns of consecration" and the "mountains of the horizon," and also suggests how confusion may have arisen between the mountains and the cow's horns. (c) The Mesopotamian sun-god Shamash rising between the Eastern Mountains, the Gates of Dawn (Ward, op. cit., p. 373). (d) The familiar Egyptian representation of the sun rising between the Eastern Mountains (the splitting of the mountain giving birth to "the ridiculous mouse"Smintheus). The ankh (life-sign) below the sun is the determinative of the act of giving birth or life. The design is heraldically supported by the Great Mother's lionesses. (e) Part of the design from a Mycenæan vase from Old Salamis (after Evans, p. 9). The cow's head and the Eastern Mountains are shown alongside one another, each of them supporting the Double Axe representing the god. (f) Part of the design from a lentoid gem from the Idæan Cave, now in the Candia Museum (after Evans, Fig. 25). If this design be compared with the Egyptian picture (a), it will be seen that Hathor's place is taken by the tree-form of the Great Mother, and the trees which in the former (a) are growing upon the Eastern Mountains are now placed alongside the "horns". In the complete design (vide Evans, op. cit., p. 44) a votary is represented blowing a conch-shell trumpet to animate the deity in the sacred tree. (g) The Eastern Mountains supporting the pillar-form of the goddess (after Evans, Fig. 66). (h) Another Mycenæan design comparable with (e). (l) Design from a signet-ring from Mycenæ (after Evans, Fig. 34). If this be compared with the Egyptian picture (a) it will be noted that the Great Mother is now replaced by a tree: the Eastern Mountains by bulls, from whose backs the trees of the Eastern Mountains are sprouting. This design affords interesting corroboration of the suggestion that the Eastern Mountains may be confused with the cow's head (see b and e) or with the cow itself. Newberry (Annals of Archæology and Anthropology, Liverpool, Vol. I, p. 28) has called attention to the intimate association (in Protodynastic Egypt) of the Eastern Mountains, the Bull and the Double Axea certain token of cultural contact with Crete. (k) The famous sculpture above the Lion Gate at Mycenæ. The pillar form of the Great Mother heraldically supported by her lioness-avatars, which correspond to the cattle of the design (1) and the Eastern Mountains of (a). The use of this design above the lintel of the gate brings it into homology with the Winged Disk. The Pillar represents the Goddess, as the Disk represents her Egyptian locum tenens, Horus; her destructive representatives (the lionesses) correspond to the two uræi of the Winged Disk design. of life and of which she kept the magic key. She was in fact the feminine form of Janus, the doorkeeper who presided over all beginnings, whether of birth, or of any kind of enterprise or new venture, or the commencement of the year (like Hathor). Janus was the guardian of the door of Olympus itself, the gate of rebirth into the immortality of the gods. The ideas underlying these conceptions found expression in an endless variety of forms, material, intellectual, and moral, wherever the influence of civilization made itself felt. I shall refer only to one group of these expressions that is directly relevant to the subject-matter of this book. I mean the custom of suspending or representing the life-giving symbol above the portal of temples and houses. Thus the plant peculiar to Artemis herself, the mugwort or Artemisia, was hung above the door, 1 just as the winged disk was sculptured upon the lintel, or the thunder-stone was placed above the door of the cowhouse 2 to afford the protection of the Great Mother's powers of life-giving to her own cattle. The Egyptians entertained the belief 1 that the sun-god was born of the celestial cow Mehetwēret, a name which means "Great Flood," and is the equivalent of the primeval ocean Nun. In other words the celestial cow Hathor, the embodiment of the life-giving waters of heaven and earth, is the mother of Horus. So also Aphrodite was born of the "Great Flood" which is the ocean. picture of the uterus, 1 in its aspect as a giver of life. But it is possible also that its other significance as an "opener of the ways" may have helped in the confusion of the hieroglyphic uterus-symbol with the key-symbol, and possibly also with double-axe symbol which the vaguely defined early Cretan Mother-Goddess wielded. For, as we have already seen (supra, p. 122), the axe also was a life-giving divinity and a magic wand (fig. 8). In his chapter on "the Origin of the Cult of Artemis," Dr. Rendel Harris refers to the reputation of Artemis as the patron of travellers, and to Parkinson's statement: "It is said of Pliny that if a traveller binde some of the hearbe [Artemisia] with him, he shall feele no weariness at all in his journey" (p. 72). Hence the high Dutch name Beifuss is applied to it. (a) "Ceremonial forked object," or "magic wand," used in the ceremony of "opening the mouth," possibly connected with (b) (a bicornuate uterus), according to Griffith ("Hieroglyphics," p. 60). (c) The Egyptian sign for a key. (d) The double axe of Crete and Egypt. It was a common practice to tie flowers to a mummy's feet, as I discovered in unwrapping the royal mummies. According to Moret (op. cit.) the flowers of Upper and Lower Egypt were tied under the king's feet at the celebration of the Sed festival. ancient Indian medical treatises was linked in name with the female organs of reproduction and the pubic bones. According to Moret (op. 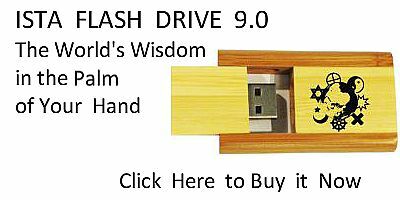 cit., p. 91) a girdle furnished with a tail was used as a sign of consecration or attainment of the divine life after death. Jung (op. cit., p. 270), who, however, tries to find a phallic meaning in all symbolism, claims that reference to the foot has such a significance. 184:1 Evans, op. cit., p. 50.
aditum aperit recipiendo semini". For other quotations see Rendel Harris, op. cit., p. 88 and the article "Janus" in Roscher's "Lexikon". 184:3 Rendel Harris, p. 73. 185:1 No doubt the two uræi of the Saga of the Winged Disk. 185:2 A. B. Cook, "Zeus;" Vol. I, p. 244. 185:3 Journal of the Manchester Egyptian and Oriental Society, 1916. 185:4 "The Influence of Egyptian Civilization in the East and in America," Bulletin of the John Rylands Library, 1916. 186:1 Evans's, Fig. 41, p. 63. 186:2 "The Seal Cylinders of Western Asia," 1910. 186:3 Paribeni, "Monumenti antichi dell accademia dei Lincei," XIX, punt. 1, pll. 1-3; and V. Duhn, "Arch. f. Religionswissensch.," XII, p. 161, pll. 2-4; quoted by Blinkenberg, "The Thunder Weapon," pp. 20 and 21, Fig. 9. 186:4 Without just reason, many writers have assumed that the pestle, which was identified with the handle used in the churning of the ocean (see de Gubernatis, p. 287 "Zoological Mythology," Vol. II, p. 361), was a phallic emblem. This meaning may have been given to the handle of the churn at a later period, when the churn itself was regarded as the Mother Pot or uterus; but we are not justified in assuming that this was its primary significance. 187:1 Gladys M. N. Davis, "The Asiatic Dionysos," p. 172. 188:1 The tortoise was the vehicle of Aphrodite also and her representatives in Central America. 188:2 Jackson, "Shells, etc.," pp. 57 et seq. 188:3 Vide supra, p. 158. 189:1 Rendel Harris, "The Ascent of Olympus," p. 80. In the building up of the idea of rebirth the ancients kept constantly before their minds a very concrete picture of the actual process of parturition and of the anatomy of the organs concerned in this physiological process. This is not the place to enter into a discussion of the anatomical facts represented in the symbolism of the "giver of life" presiding over the portal and the "two hills" which are divided at the birth of the deity: but the real significance of the primitive imagery cannot be wholly ignored if we want to understand the meaning of the phraseology used by the ancient writers. 189:2 Blinckenberg, "The Thunder-weapon," p. 72. 189:3 Aylward M. Blackman, "Sacramental Ideas and Usages in Ancient Egypt," Proceedings of the Society of Biblical Archæology, March, 1918, p. 64. 190:1 Op. cit., p. 60. 190:2 "Archæol. Survey of Egypt," 5th Memoir, 1896, p. 31. 190:3 See especially op. cit., p. 35, the goddess of streams and marshes, who was also herself "the mother plant," like the mother of Horus. 190:4 Whose cultural associations with the Great Mother in the Eastern Mediterranean littoral has been discussed by Sir Arthur Evans, "Mycenæan Tree and Pillar Cult," pp. 49 et seq. Compare also Apollo hyakinthos as further evidence of the link with Artemis. 190:5 P. J. Veth, "Internat. Arch. f. Ethnol.," Bd. 7, pp. 203 and 204. 191:2 Budge, "The Gods of the Egyptians," Vol. I, pp. 436 and 437. 191:3 Alan Gardiner, "Life and Death (Egyptian)," Hastings Encyclopædia of Religion and Ethics.